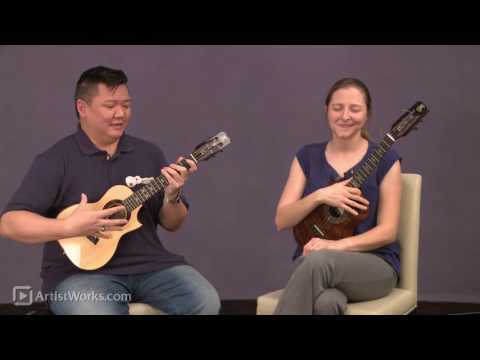 Craig Chee and Sarah Maisel are outspoken educators on the ukulele, bringing their easy-to-understand approach to festivals all over the world, including their annual Ukulele Cruise (now in its fourth year). For those that are able to attend one or more classes, they leave with a wealth of information and a smile on their face. Thankfully for those that can't attend, Craig and Sarah have an extensive collection of online video tutorials, thanks to ArtistWorks. 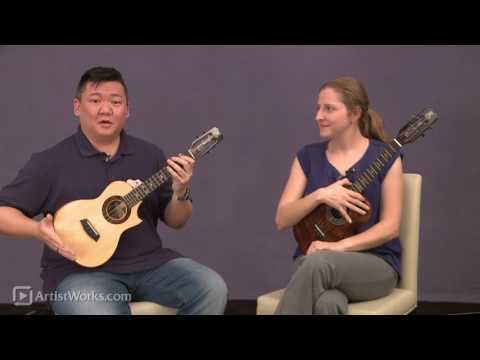 During their most recent trip to the ArtistWorks facilities, Craig and Sarah sat down to talk about GHS Strings; the origins of their signature sets, as well as Craig's special "Bari-Tenor" tuned string set. The "Bari-Tenor" tuned string set is very unique; it's a re-entrant baritone ukulele tuning, optimized for the shorter tenor scale length. Craig and Sarah easily explain the rationale behind the set, and provide examples that show the true potential of this set. Combined with a ukulele in standard tuning, the sound is full and rich with only two ukuleles. For those players looking for something different, or to help round out the sound in their ukulele group, the CU-BTR "Bari-Tenor" set would be a great option.